The importance of youth involvement in agriculture is stressed in Flagler County Farm Bureau. The YF&R and Women’s Chair host local farm tours to educate teachers, students and administrators on agriculture. Curriculum used in programs like Florida Ag in the Classroom is incorporated in these tours and gives members the opportunity to participate in Ag Literacy Day, where they can visit schools and read to students. 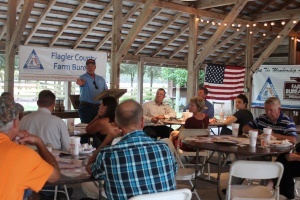 Strengthening the community’s involvement in agriculture is one of the topics up for discussion at the Flagler County Farm Bureau annual meeting. Members gather for fellowship and BBQ while discussing future plans for growth.